George Sanders takes over from Louis Hayward in the second Saint film. Here the the killer of bad guys is softened to be a witty "crook" one step ahead of everyone. Again teamed up with Inspector Fernack (Jonathan Hale) Simon Templar gets involved in helping to clear the name of a policeman who was framed by his friends. More funny than garish and fueled by the wit and charm that would make this series and the subsequent Falcon one run for the better part of the decade this is less a mystery than Sanders making fun of everyone. Sure his jokes are less cruel to his friends but he is clearly in control and we're along for the ride. One of the best in the series this is just a wonderful. A wonderful bon monts and general curiosity to see how Templar will pull this off make this a wonderful romp. 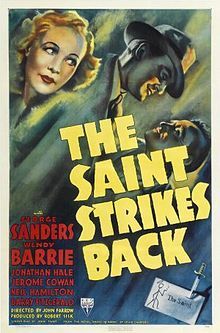 Never meant to be more than a lively romp and grand entertainment THE SAINT STRIKES BACK is a great way to destress and chill out.